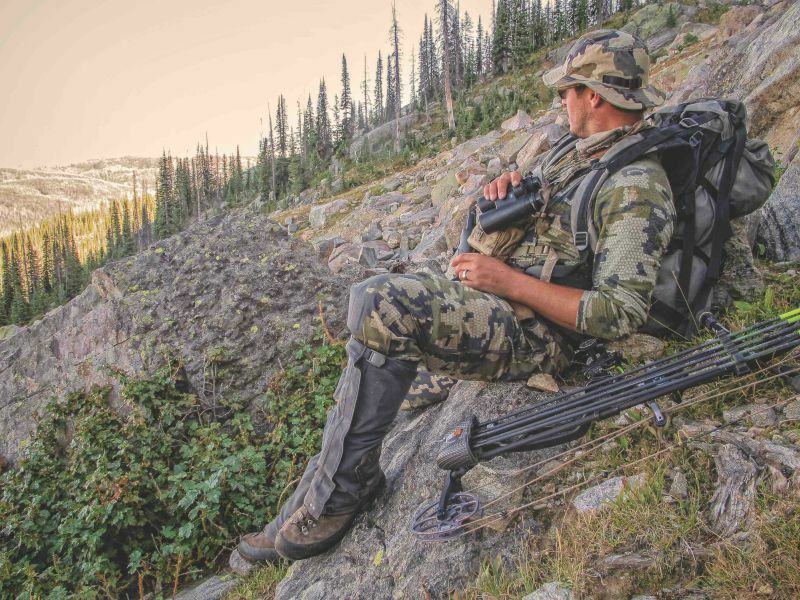 Because he’s not a high-profile pro staff member or TV personality, chances are good that you’ve never heard of J.C. Navarro, a bull elk’s worst nightmare. J.C. Navarro and his massive 370-class Wyoming bull. I don’t do many columns like this. In fact, I’ve never done one — a column focusing solely on the success of another bowhunter. So, why start now? Simple: The story of my good friend and bowhunting partner J.C. Navarro is one I feel people need to hear. And, no, not just the tale about the behemoth he’s posing with at the top of this page. Rather, it’s the story of his journey to fulfill this lifelong goal. Here we go! A standout athlete in high school, J.C. Navarro was a 3-year starter for the still-feared-to-this-day Natrona High School Mustangs. A 5A classification high school nestled in the heart of Casper, Wyoming, Navarro wore No. 32 and had a knack for dismantling defenses with his fearless, break-your-ankles running. During his senior season, he led the Mustang’s to the Class 5A State Championship. In addition, he was later branded with the state’s most coveted football award: Wyoming’s Gatorade Player of the Year. The following fall, Navarro’s football career took him to Chadron State College in Nebraska. He was poised and ready to lead the Eagles much like he’d led his Mustangs. However, after matching talents on the gridiron with fellow freshman standout Danny Woodhead — the same Danny Woodhead who later played for the likes of the New York Jets, World Champion New England Patriots, San Diego Chargers and Baltimore Ravens — Navarro found himself in a backup role. Missing home dearly and frustrated, Navarro hung up his cleats and went on to pursue other passions. Just like that, his football career was over. After spending a spell working in the oil fields of Wyoming, J.C. Navarro decided it was time to go back to his childhood roots of bull riding. As with everything in his life, Navarro set an immediate goal to go straight to the top. It was going to be the PBR’s Built Ford Tough Series or nothing. Without hesitation, Navarro packed his bags and moved to North Carolina to live with bull riding legend Jerome Davis. Four short years later, he called for his bull at his first-ever PBR event, where he went on to finish 10th. Oh, and that was without being able to ride in the short round due to an injury. The PBR was abuzz about their talented new rookie. Sadly, injuries continued for J.C. Navarro. They plagued his career, and after an ultra-serious hang-up where his spur hung in a bull’s flank rope, tearing all the major ligaments in his knee, Navarro was forced to have major surgery and begin rehab. Still motivated, still setting his goals high, Navarro crushed his rehab, only to come back and tear both of his groins away from the bone. Sadly, this injury ended a promising career making money 8 seconds at a time. Disappointed but hungry for a new challenge, J.C. Navarro found archery, and never looked back. What J.C. Navarro won’t tell you, because he is too humble, is that during a 3-year span in his favorite Wyoming unit, he passed throngs of bulls in the 320- to 340-inch range. How do I know? Because I witnessed it. I told him he was crazy. But he had a goal, and like he’s done his entire life, he planned to achieve it. He didn’t care about eating a tag or about what other people thought. He knew he was becoming a good elk hunter — calling in numerous bulls each year and crafting his approach to each setup. Having hunted with J.C. for a number of years, I can tell you few are better with a piece of latex in their mouth, and few are savvier about getting big bulls in close. His methods, though unconventional, get the job done. Be sure to take the time and click here to read the story of his 370-inch Wyoming giant and learn about the best elk hunter you’ve never heard of. Enjoy!